Before we get to the Top 3 Uses of Beeswax, let’s first look at where beeswax comes from. The honeybee is the only bee that produces beeswax. More specifically, the substance comes from young worker bees (the females) and the honeycomb. Beeswax is made by the worker bees through the consumption of honey produced through the collection of flower nectar. Honey bee workers have four pairs of wax-secreting glands on the underside of their abdomens. Once a worker bee becomes an adult, they begin creating the wonderful substance of beeswax! From their glands they produce liquified wax, which hardens into thin scales when exposed to air. Under the appropriate conditions, meaning there are adequate food supply and the temperature within the hive is between 91 – 97 degrees fahrenheit, worker bees can produce beeswax on demand. Beeswax carries antiviral, anti-inflammatory, and antibacterial properties (big words associated with the power of healing) that are essential in fighting chapped skin. Thankfully, beeswax can assist on those dry winter days when you so badly want to find some relief from your chapped lips! It forms a protective coat by sealing in moisture to our skin without smothering and clogging up the pores. In its ability to heal, it can soothe any pain caused by dryness or dehydration. Better yet – it contains Vitamin A! 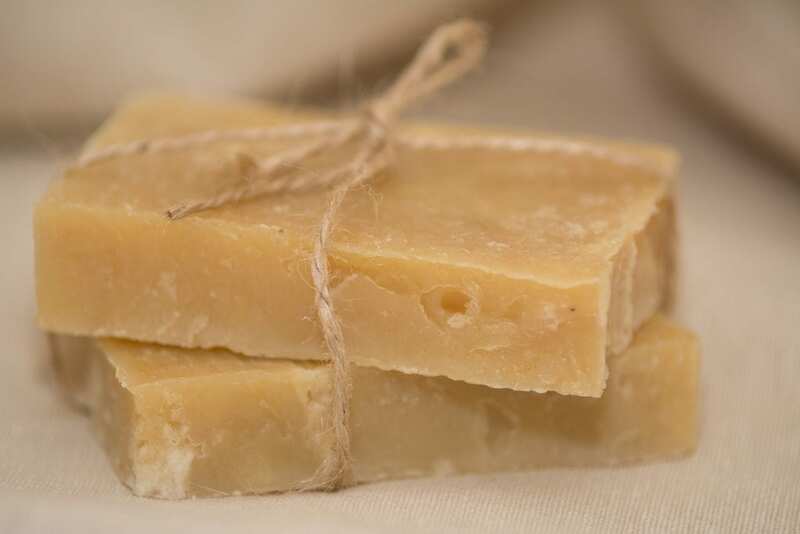 Beeswax is known to be a staple for dry skin treatments, especially for those that are affected by eczema, psoriasis, dermatitis, acne, and stretch marks. Its antiseptic and medicinal properties keep the skin infection from spreading while actively working to eliminate it. It also has the ability to keep in moisture, which helps the skin stay moist and refreshed. In its soothing properties and rich Vitamin A content, it will boost skin cell production and give a healthy and restorative regeneration to the skin. Although beeswax is a strong component in skin care and skin treatment, it also has other uses that aid your daily household. Beeswax is a phenomenal sealant; there’s a reason why it was used to seal envelopes long ago. Nowadays, it can be used as an alternative to plastic wrap, with the cotton being laced with beeswax. It’s an environmentally friendly way to store food, pack lunches and keep your homemade bread from drying out! A win, win (because nobody likes dry bread)! Not to mention, when the wrap runs its course, you can use it as compost OR for fire kindle. It’s diversity is endless! Not only can beeswax preserve your food, but it can also assist in furniture upkeep, preventing rust, and be a granite polish. Often household cleaners, even those that are used on furniture, are plagued with chemicals. Beeswax is a healthy alternative. It can lubricant squeaky furniture joints, doors, and windows and at the same time, coat your tools, cast iron, shovels or handles from rusting. It is a fantastic furniture and granite polish that allows for a soft finish alwhile removing residue! And of course, who doesn’t love a beeswax candle?! Paraffin candles are petroleum derived and can release chemicals in the air. Contrastly, pure beeswax candles burn with a lovely scent that cleans the air by releasing negative ions. They are helpful for those that have allegeries and are affective in removing allegerens such as dust and and dander from the air. Research reports that long chain fats and alcohol found in honeycom appear to significantly lower bad cholesterol as well as have antioxidant effects that help protect your liver. Notably, it has been studied and used as a pain reliever and reducing inflammation due to its anti-swelling effects. In all, we can see that the honeybees creation of beeswax is a vital component of wellness. A multi faceted physical, external and internal helper that merits natural healing properties and aids. Preserving honeybees and their colonies are important to us! Let us assist in your Live Bee Removal AND know their liveliness can bring healing to our world!